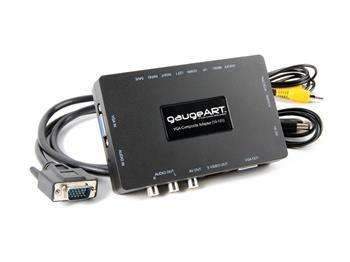 The gaugeART Video Gauge Adapter allows real time monitoring of vehicle engines. The system interfaces with Haltech’s ECU and produces a video signal which can then be displayed on a video monitor such as an in-car navigation system, aftermarket double DIN stereo or a separate LCD display. 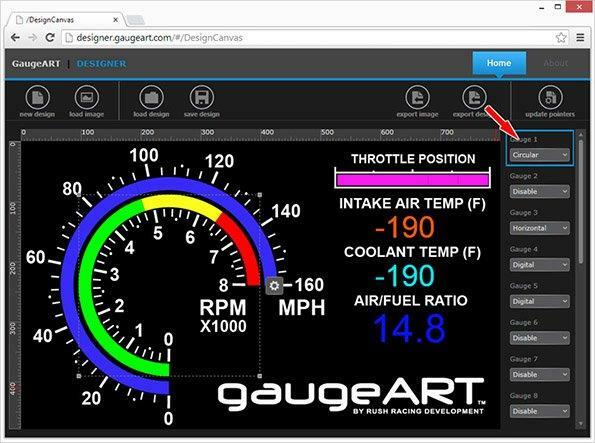 The system is unique not only in its ability to display on any monitor with a video input available but also in its ability to allow you to completely customize the design of the gauges displayed. The display generated is completely customizable with the innovative gaugeDesigner website which allows you to customize which information and how the information is displayed including digitally, circular gauges, and horizontal and vertical bar graphs. An unlimited number of designs can be created, shared, and saved to the included microSD card using the included microSD adapter which is inserted in to the gaugeART Video Gauge Adapter. There are three standard video connection types: VGA, HDMI, and composite. VGA is the standard connection type used by gaugeART, and will give the best quality. Most stand alone displays have a VGA input. Most in-dash navigation systems do not have a VGA input and must use a HDMI or composite video converter. HDMI will give the best quality display of the two. Displays using only a composite input will appear not as sharp as a VGA or HDMI input. Displays with a VGA input & 800×480 resolution will offer the best quality images. However, other resolution displays can be used as long as the display is compatible with a 800×480 resolution input. Make sure that the display you intend to use is compatible with the 800×480 resolution video signal before purchasing. Many displays offer the ability to adjust scaling in their settings. You should also select a display that turns on automatically with ignition power so that the power button does not need to be pressed every time the car is turned on. Models with HDMI are preferred as the gaugeART display quality will be much higher than with composite. An inexpensive adapter is required to use a composite or HDMI input.